I'm just one short of 25 repeats of the medallion... photographed on the patio under the setting sun. Here is the pattern for anyone who'd like to give it a try. Clicking on image will take you to the pattern. Knowing your love of squares, I vote for square! Thanks for sharing your pattern! I would keep it square! The medallions look great joined together - no matter how large you decide to make it. I look forward to seeing what kind of border you add to finish it off. Thanks so much for the pattern! It’s lovely! Perhaps it depends on where it’s going to be put? Rectangle is more traditional maybe. Wow! I can't get over how square the medallions end up looking when joined! I vote for the rectangle myself. 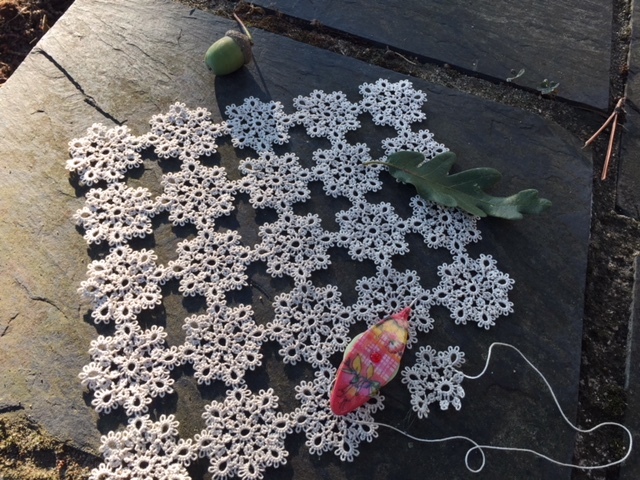 The light on your patio is gorgeous as is the tatting! Thank you for the pattern too! Surprising isn't it? Also interesting to see the cross that forms at the intersection. Ganz herzlichen Dank für das Muster und auch das Video. Ich werde es demnächst ausprobieren. Beeindruckend wie das Muster des Medaillons aneinandergereiht wirkt. Es ergibt bestimmt einen schönen Läufer. Thank you so much for sharing your pattern! Thank you for sharing the pattern, knowing you it will end up as a square. All of your videos are fabulous and I'm speechless after watching this one! 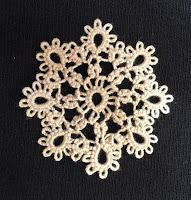 So many techniques including mock picots and hiding threads, not to mention tatting rings-only medallions without cutting and tying, and some finger tatting. 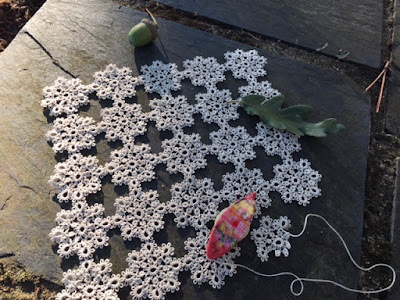 It's amazing how these medallions can form a square doily! I've never fully understood the magic loop, and now I do. Really, this video is fantastic, beautifully presented. How can anyone not see the total efficiency of the bobbin shuttle and the slip/slide method of tatting. Thank you for taking the time to do this. Perfection in every way! oh, I like that little medallion, thanks for the pattern.